A warning before I start talking about the book - I actually lent the book to a friend so I don't have it on hand, and as I never take notes this may not be the most detailed review ever. Ah well! This is my second proper Neil Gaiman book, and it made me feel that in time, he may well become one of my favourite authors. The Graveyard Book tells the story of a toddler who manages to escape from his crib and make his way to the local graveyard on the same night that a man comes to his house to murder his family. Naturally, the ghost residents of the graveyard agree to take him in, with the help of a mysterious friend of the graveyard called Silas. So the toddler is adopted by the ghosts of Mr and Mrs Owen, and they decide to call him Nobody Owens, or Bod for short. The book follows Bod as he grows up and gets up to all sorts of mischief. Now looking at that summary of the story, that is a pretty depressing way to start a book, but as it is a children's book we are spared the horrible details. The book has a sort of loose ongoing plot to do with the initial murders weaved through it, but it is mostly a collection of short stories featuring the same characters, that involve Bod going on some kind of adventure, learning something, and growing. 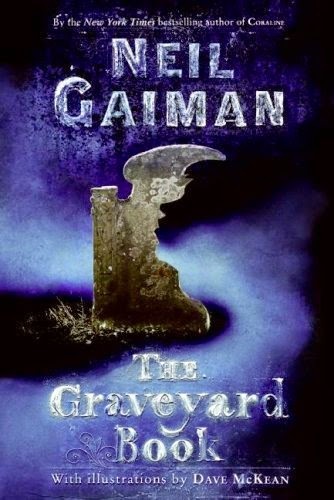 In other hands this could be very boring, or far too childish for an adult to read and enjoy, but Gaiman seems to be the perfect person to tell this kind of story. All of Bod's adventures are very entertaining and a bit dark, which is the ideal combination for me. I really loved all of the characters in the book, from the adventurous, curious Bod to the mysterious Silas, and could happily have read several more volumes detailing Bod's adventures. Alas, the book did not last forever. My one complaint about the book (because I can never just like anything, apparently) doesn't really have anything to do with the writing. I don't know if all copies of the book have pictures, but mine did, and although I didn't dislike them, they showed Bod wearing normal clothes and then on the next page there were descriptions of him just being wrapped in a grey sheet, and that kind of thing drives me slightly crazy when reading books! But that is literally the only thing that I disliked about the book. If you are looking for a charming, easy to read novel that you could easily read in chunks and then put aside for a while (although why you would want to, I have no idea), then I definitely recommend this. I definitely need to try more Gaiman, I think I might read more of his children's books first before anything else, because I'm a bit scared of not liking some of his adult stuff. I know that when I read Smoke and Mirrors, a few of the stories weren't quite my cup of tea, which is fine for a short story but would make me sad it if was a whole novel. I actually finished this in October (even though I am actively trying to update my blog more often, I am wayyyyy behind in writing stuff about things that I have been reading), so for once I read a spooky book in the run up to Halloween. Yay me! I've had this for YEARS AND YEARS, yet I still haven't read it - which is ridiculous for such a little book. I did read Coraline last year, but it creeped me out so much that I kind of hastily skipped over TGB this Halloween. Like maybe the Other Mother would spontaneously erupt from between the pages or something. *stares around wildly* Soon... SOON! You should definitely read it, I think it's more charming than it is creepy. And as each chapter is like a short story rather than an ongoing thing, it would be very easy to put down for a while if you do find that it's creeping you out. What I have heard about Coraline does sound quite creepy, but I enjoy being creeped out so that actually makes me want to read it more!